Lots of Texas Republicans outperformed Donald Trump on the 2016 ballot, and many of them wouldn't be in office if they hadn't. In a presidential midterm year, overcoming the president's shortcomings might be the key to re-election. Missed in all of the punditry about which Republican incumbents are in trouble because of possible blowback against Donald Trump: How’d those incumbents do when Trump was on the ballot? 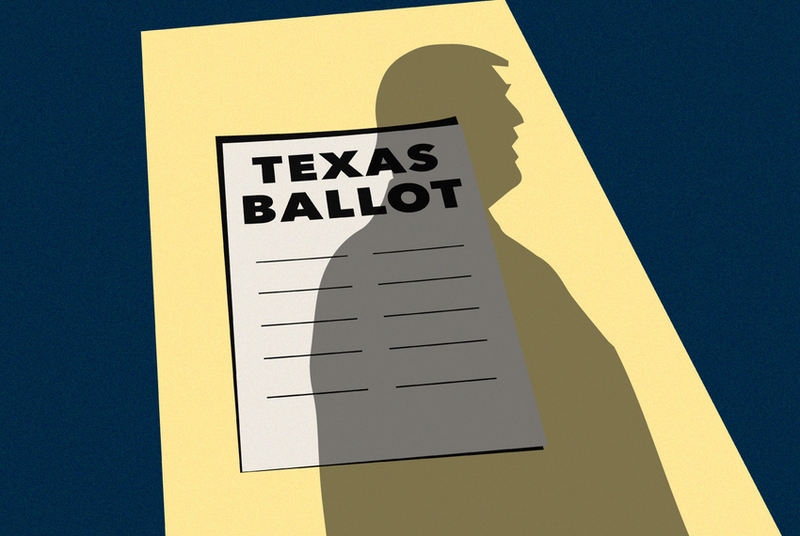 Several Texas legislators and members of Congress are in office only because they outperformed the president in the 2016 elections — some of them marking a path to political survival should Trump have the sort of midterm terrors that have plagued past presidents. In spite of Trump’s relative weakness on the 2016 ballot in Texas — the average statewide Republican candidate got 54.3 percent of the vote to Trump’s 52.2 percent — the Republicans who won office did so by doing better on Election Day than their top-of-ticket candidate. This year’s elections raise the question anew: If Trump has a mediocre midterm election, what will it take for a Republican candidate in Texas to win? U.S. Rep. Will Hurd, R-Helotes, had the hardest time getting elected in 2016. He has the hardest turf to defend — the 23rd is the only real swing seat among Texas’ congressional districts. Hurd won re-election that year with 48.3 percent of the vote. He did that by outdoing Trump, who received 45.9 percent of the district's vote. Seven current Texas Republican state representatives won in 2016 in districts where Trump got less than 45 percent of the vote. Sarah Davis of West University Place, for instance, won with 53.6 percent of the vote in 2016 while Trump received only 39.3 percent of the votes in her district. That’s a 14.3 percentage-point difference from the top race to Davis’. Some incumbents might be wishing they were more like Davis — at least in her ability to outdo the GOP’s standard bearer. State Rep. Rodney Anderson of Grand Prairie drew just a skosh more than a majority of votes in 2016 — he got 50.07 percent — in a district where Trump got 43.6 percent. Trump isn’t the only factor, and Anderson outdid him by more than six percentage points, but the legislator doesn’t have a lot of wiggle room in that competitive district. State Sen. Don Huffines of Dallas hasn’t been on the same ballot with Trump, who lost to Hillary Clinton in that otherwise conservative district. The average statewide Republican candidate there got 51.6 percent of votes in 2016, or about 6.3 percentage points ahead of Trump. State Rep. Tony Dale of Cedar Park got 55 percent in 2016; Trump was more than ten points behind him. A Democrat with an eye on that seat would point to Trump’s weakness; a Republican, to Dale’s strength. It’s a district where a president in a difficult midterm could cost an incumbent Republican legislator a seat, but also one where the incumbent has some insulation against a chill political wind emanating from Washington, D.C.
It’s possible, of course, that 2018 might not be at all bad for Republicans in Texas. As of February, the University of Texas/Texas Tribune Poll found the president in fine mettle with Republican voters, even when they were asked about particular attributes where other voters found him wanting. Still, indications of potential weakness can attract enemy fire in an election year where the balance of power in Congress is in play. Some Democrats, particularly after last week’s upset win in Pennsylvania, are scouring maps for districts held by Republicans where Trump and Clinton were separated by fewer than 10 percentage points in 2016. Texas has eight of those. Another way to fix targets is to look for places where incumbent Republicans won and Hillary Clinton beat Trump. Texas has three of those. And then there’s the relative strength of the incumbent Republican member of Congress in 2016, compared to the man at the top of the ticket. U.S. Reps. Kenny Marchant of Coppell, Michael McCaul of Austin and Lamar Smith of San Antonio are all in districts where Republicans have historic advantages. In 2014, Republican statewide candidates beat Democrats by an average of more than 20 percentage points in each of those districts. But in 2016, Marchant outdid Trump by only 5.7 percentage points. McCaul’s margin was 5.4 percentage points, and Smith’s was 5.1 percentage points. Smith isn’t seeking re-election and his seat is open this year. It is also an example of a district where Trump’s perceived weakness attracted the interest of the Democrats who, given recent history, might have shopped elsewhere for electoral opportunities.